Some JAZZ LIVES readers might wonder why my title warrants an exclamation point. The music, I think, will speak for itself — but the singular pianist Ray Skjelbred had suffered a broken hip earlier this summer . . . and he is now back playing and sounding like himself. 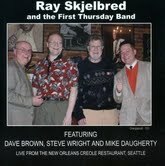 Here are four video performances (thanks to Candace Brown) recorded at the monthly gig of the First Thursday Jazz Band, with guest Craig Flory on reeds, at the New Orleans Creole Restaurant in Seattle’s Pioneer Square, Seattle. Along with Ray, you’ll hear and see Dave Brown, bass, and Mike Daugherty, on drums. So happy you’re back on the bench, Mister Ray! And thanks to Craig, Dave, Mike, Natalie, Kevin, and especially Candace (without her, this would all be hearsay). I have it on the best authority that Ray and his Cubs (the Chicago kind) will be performing for the Sacramento Traditional Jazz Society this Sunday, September 11, 2011, at The Dante Club, 2330 Fair Oaks Blvd., Sacramento, CA 95825, from noon to 5 PM. For more information visit: http://www.sacjazz.org/calendar.html. I know that my friend and colleague RaeAnn Berry will be there: join her in the fun!